Silvetia compressa: The typical mainland form is an olive green or yellowish brown plant about 30 cm long (up to 90 cm long), composed of thick, narrow, dichotomous fronds that often appear irregularly branched because of axis breakage. A finer-branched, lighter-colored form is more typical of the Channel Islands (Abbott and Hollenberg 1976; Silva et al. 2004). Silvetia compressa deliquescens: Thalli slender relative to S. compressa, with more branches (Abbott and Hollenberg 1976). Silvetia compressa: Locally abundant in the midtidal zone, forming beds on rocks somewhat protected from open surf. Ranges from Horswell Channel, British Columbia to Punta Baja, Baja California (Abbott and Hollenberg 1976). Silvetia compressa deliquescens: Found in Pebble Beach (Monterey Co.) and Channel Islands, where it is abundant and replaces S. compressa (Abbott and Hollenberg 1976). 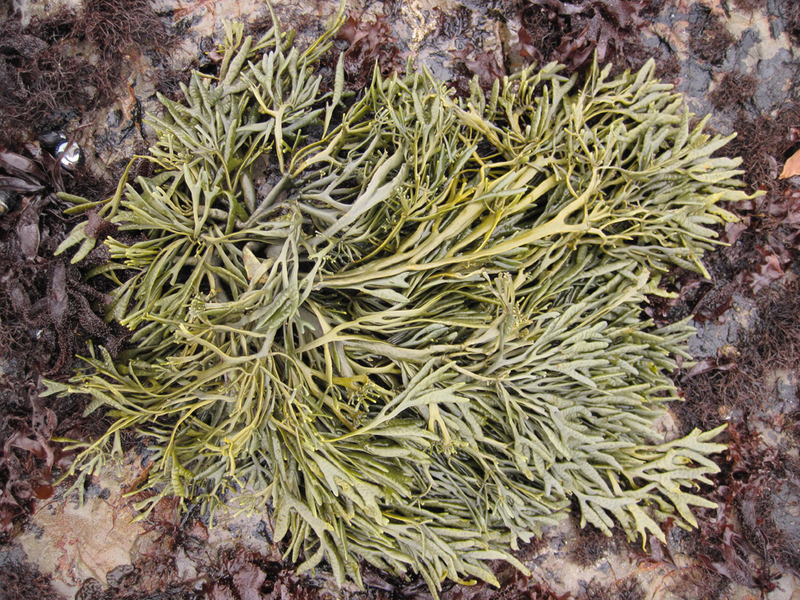 Can be confused with the other common rockweeds: Hesperophycus californicus, Pelvetiopsis limitata, and Fucus gardneri. Fucus and Hesperophycus generally have wider fronds with midribs, whereas Silvetia and Pelvetiopsis have narrower fronds that lack a midrib. Pelvetiopsis develops tiny pits (cryptostomata) with white hairs but these are inconspicuous (Abbott and Hollenberg 1976). Silvetia generally occurs lower than Pelvetiopsis. Silvetia is a dominant perennial alga that allows algae and many animals to live higher up on the shore by creating a moist microhabitat (Hill 1980, Gunnill 1983, Sapper and Murray 2003). Like other rockweeds, reproductive structures are produced in swollen branch termini called receptacles. Unlike Fucus and Hesperophycus, these are rarely inflated with gases. Gametangia occur in pits (conceptacles) that dot the surface of fertile receptacles. Gametes are released during receding tides and dispersal is very limited (Johnson and Brawley 1998). In spite of being a tough and long-lived species, Silvetia is slow-growing, experiences irregular recruitment and has low survivorship (Gunnill 1980). Silvetia is susceptible to trampling (Denis and Murray 2001) and oiling because of its midtidal height and recovery from disturbance is believed to be long (Hill 1980, Vesco and Gillard 1980). A recent study has shown that Silvetia can be transplanted and reestablished for restorative purposes (Whitaker et al. 2010).